One thing is for certain, energy is only going to continue to become more expensive as the years go by. People are always looking at different ways to reduce their home monthly bills, and one way is to generate energy from solar panels. Renewable energy projects at home can be expensive. The time recouping these costs can take quite a while but the end result is cheap energy. A major expense in the process of solar energy panel installation is the storage battery bank. The battery bank will be used when the sun is not shining. It is possible to find cheap deep cycle battery storage and if you follow the 5 points outlined below, you will be able to keep the costs of purchasing the batteries relatively low. The types of battery used in the storage bank are lead-acid deep cycle batteries. These batteries are designed to recharge and discharge quite frequently. These types of batteries are very expensive when bought brand new. There is a way that you may be able to pick up cheap ones, or even free ones. 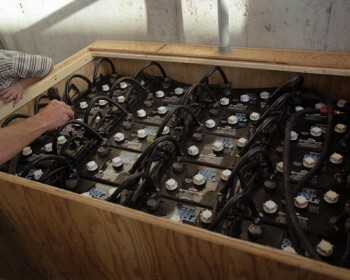 You can find these types of batteries used on electric golf carts, wheelchairs, and even boats. Golf clubs or boat yards will often times have discarded batteries and in many cases be glad to get the batteries off of their hands. The first thing you will have to do once you have procured your batteries is to test them. There are certain issues or faults that will make them useless. Testing them is quite simple. All you have to do is connect them to a charger and charge them. As soon as you have charged them, you will need to take a measurement of the voltage with a multi-meter. The meter should have a reading near 12 volts. If your reading is a lot lower than 12 volts, it could be an indication that there is a bad cell or bad cells. Mark it and put it to the side to test further later. You will want to focus your priorities on the batteries that reach the 12 volt reading. The lead plates that are located inside the cells are more than likely to be contaminated. This is a result of a process called sulfation. Sulfation is when the lead plates have a layer of lead sulfate crystals on them even when the unit is fully charged. This process of sulfation is what prevents the batteries from holding a charge. You will then need to remove the contamination by using a different charger. This special charger is sends a high current pulse out to the battery that will break down the crystals, thus reducing the contamination. I know there is concern about the cost of the charger, but the money you will save on new batteries will make up for the initial investment for the charger and locating cheap or free batteries. Next you will have to renew the electrolyte inside of the cells. The electrolyte is the fluid that is located in the case between the lead plates. Deionzed water should be used for this step. This water should be refilled to cover the lead plates located inside the battery cell. An electrolyte conditioner may also be added to the cells. This conditioner can be found online or at a local auto parts store. The lasts step is to recharge the recently restored battery and then test the voltage again. After you have done the reconditioning process, the second hand should be able to hold the electric charge from the Photovoltaic (PV) panels. The 5 steps above may seem tedious, nonetheless, doing so will save you a lot of money when you are setting up a home battery storage bank. This is how you will be able to find a cheap or free battery cell for your own personal home solar power plant. Following these steps you will be able to make renewable energy a much more viable option. It will also make the process more of a cost effective idea. By finding these deep cycle batteries cheap, you will reduce the initial investment and shorten the time it takes for you to notice the savings that using a renewable, green energy such as solar power.